This small building in the back will be my art studio someday - it has some water damage inside and will need some work, but I'm excited about the possibilities! 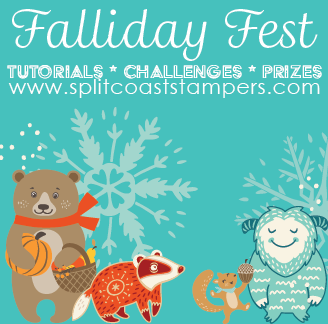 Falliday Fest is still going strong - we have challenges and tutorials scheduled until the end of the week, and next week is reserved for catching up and chatting together. Come and join us! Congratulations! I'm so glad for you all. It's a beautiful place! your property is beautiful! congratulations and share pics of your studio when it is done, I can imagine the art created there. Look fabulous- quiet and peaceful... can't put a price on that! Praying you have many wonderful years there .